Our premium coarse product designed for heavy foot traffic and work environments where a larger grit is required to resist clogging due to excessive dirt, dust, etc. NS5300B offers a textured grit surface (46 grit) manufactured from a cross-linked polyolefin that is more durable than conventional PVC vinyl and is imbedded with an aggressive 46 grit silicon carbide stone that won't wear down and round off as rapidly as competitors' products. 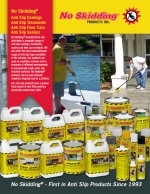 NS5300B is a long lasting and chemical resistant product used around the world in OEM applications requiring a consistent, reliable excellent quality anti slip product. Silicon carbide grit and durable rubber based adhesive system. Supplied in 60 ft. rolls and custom sizes. 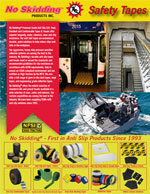 1/2" X 60 ft. NS5300B Series Anti-Slip High Traction Coarse Safety Tape - Silicon Carbide Black Grit - $9 per roll. NS5300B Heavy Duty Coarse is long lasting for tough applications. Suitable for industrial areas, loading ramps, dock areas, walkways, stairwells, work areas, machine shops, industrial equipment, trucks, and hundreds of OEM applications. 0.5 inch by 60 ft.
3/4" X 60 ft. NS5300B Series Anti-Slip High Traction Coarse Safety Tape - Silicon Carbide Black Grit - $13 per roll. Suitable for industrial areas, loading ramps, dock areas, walkways, stairwells, work areas, machine shops, industrial equipment, trucks & trailers, and hundreds of OEM applications.